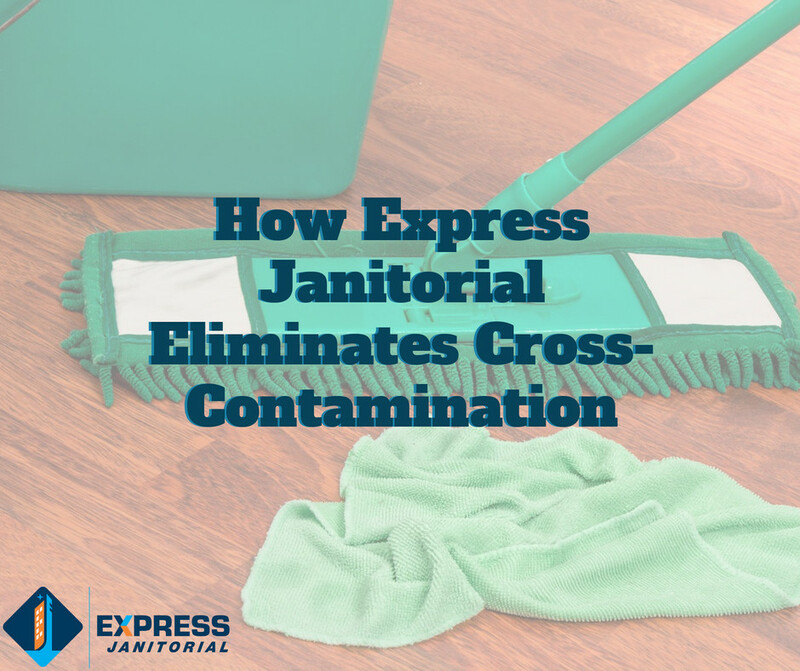 At Express Janitorial, we are a full-service janitorial company, meaning we clean your bathrooms, kitchens, offices, and every other room you may have. Considering we service so many types of areas, we have found that cross-contamination can be a pretty big issue. Our number one goal is to make sure we are keeping your space clean and you healthy! This is why we have initiated our cross-contamination program. You may have noticed once or twice while you were in public that the janitorial crew was using a white rag to clean. Many places use white rags, and they use those white rags for every room they clean. This is not to say that they use the “same” rag for every room, however, while all the rags are the same color, it is more difficult to differentiate between which rags have been used in what room. The solution that we have initiated is very simple but it works very well. We use a different color towel for each room, eliminating the doubt of using the same rag in the kitchen as we would in the restrooms. What Color is Used Where? Blue is used for office cleaning, general cleaning, dusting, etc. Red is used in the bathrooms. All of our rags are made of microfibers, which are the best to use for cleaning, especially dusting. Moreover, we also use our color-coded programs for our mop heads too! Much like the mops you would see in a hospital, we use each mop head once and then send them off to be cleaned. As a result, we are always giving you the cleanest floors. For example, if we have 10 rooms to clean in a facility then we would have 10 mops. We really just go the extra mile to keep your space clean! If you are looking for a better janitorial services company that gives you a truly clean environment to work in, then please contact us today! Express Janitorial offers janitorial services to all, including many Fortune 500 companies, from Cleveland to Akron.